Affordable data capable point to point system designed for voice/fax/credit card terminal transmission. Quality, performance, and price combine to form one of our most popular cordless phones the C1. 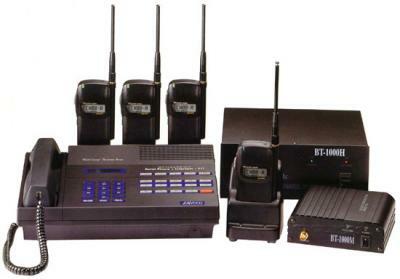 This system offers a communication range of up to 15km and a long list of advanced features. The system s fixed site remote unit incorporates a built in RJ-11 port which may be used to connect a fax machine, modem, or any other RJ-11 compatible device. This very popular feature allows the user to check e mail, access the internet, send and receive faxes, and more (transmission speed of up to 14.4bps). 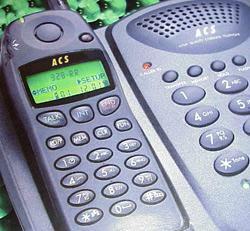 Additionally, any conventional cordless phone may be plugged into this port to allow for greater mobility. The user may wire his remote location so that each room has a telephone jack. Each individual jack will integrate with a C1 remote system allowing for true land line quality in every room in the house. This system operates on a similar premise as our flagship model, the XL7200. Up to 7 lines with 99 extensions may be used with this system (extra lines require optional equipment). Users may transfer calls between terminals, initiate conference calls with multiple terminals, and more. An individualized ring tone may be specified for each terminal, a useful feature for distinguishing users in a multiple unit configuration. Before a call is placed, the C1 automatically scans the channel spectrum for the clearest channel on which to place the call. The result of this channel scan is crisp, clear voice quality on most every call. The user may also manually select a channel if he desires. Either way, the remote station s Receiving Signal Strength Indicator (RSSI) will display reception strength on the LCD. The C1 configured as a point to point system. The C1 has many other advanced features, like a 20 number alpha-numeric memory, and emergency speed dial. Also standard is a menu utility allowing for outgoing call restriction and/or long distance call blocking. A time elapsed counter appears on the display whenever a call is placed, a useful feature for tracking time spent on a certain call. The user can even specify a talk time limit. The illuminated keypad and any key answer are also useful. The C1 is our most affordable data capable system. This high quality phone is designed to take the abuse of rigorous daily use. A one year parts and labor warranty is standard, a lifetime warranty is available for an additional fee. Questions? Please contact us.